In a world of ever changing values, there are still some things upon which you can rely. One of these is that Resene will continue to strive to produce the best paints that it possibly can, benchmarked against the highest international standards. 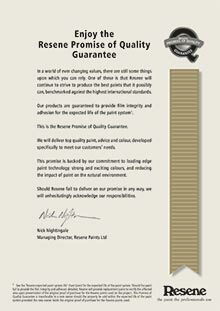 This is the Resene Promise of Quality Guarantee. We will deliver top quality paint, advice and colour, developed specifically to meet our customers’ needs. This promise is backed by our commitment to leading edge paint technology, strong and exciting colours, and reducing the impact of paint on the natural environment. Should Resene fail to deliver on our promise in any way, we will unhesitatingly acknowledge our responsibilities. 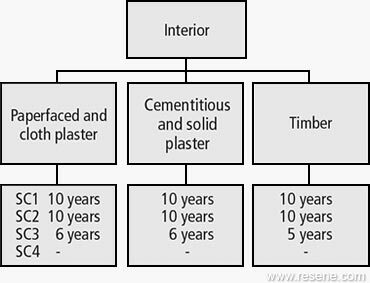 1 See the ‘Resene expected paint system life’ chart (below) for the expected life of the paint system. Should the paint fail to provide the film integrity and adhesion detailed, Resene will provide replacement paint to rectify the affected area upon presentation of the original proof of purchase for the Resene paints used on the project. This Promise of Quality Guarantee is transferable to a new owner should the property be sold within the expected life of the paint system provided the new owner holds the original proof of purchase for the Resene paints used. 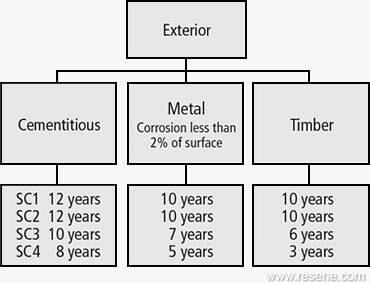 The expected paint system life chart below indicates the expected life of a well maintained pigmented waterborne paint system applied to a properly prepared surface to the specifications of Resene before recoating is required. Well maintained means regular washing of exterior surfaces and repairing any obvious damage. See the Resene Caring for your paint finish brochure for recommended cleaning instructions. Painting an EXTERIOR building. The concrete WALLS are to be painted and the surface condition is described as ‘IDEAL’ (SC1), giving the indication that 12 years could be expected provided regular washing and repairs are carried out during this time. After this the surface will require painting. The box at the bottom of this page gauges the expected surface condition at the end of the stated lifetime. The system for example should have received very little change (0) in surface cracking but it would be expected to have suffered colour change (3). Exterior expected life figures are for vertical exposure. Surfaces less than 60° to the horizontal will have a 50% reduced life expectancy compared to the stated life expectancies above. Interior expected life figures refer only to durability characteristics of chipping, cracking, flaking, peeling and general film integrity. Colourfastness is excluded. Due to the vast range of staining and the varying effects of this on the substrate and finish it is not possible to include these factors in a general guideline. Extreme marine environments, adhesion failure of previous coatings, dark colours, substrate damage or use of solventborne products will result in reduced life expectancies. Refer Resene for assistance. SC1: IDEAL New surface in excellent condition. No defects. Surface has not been exposed to weather. SC2: GOOD Coated surfaces requiring repaint for cosmetic reasons only. Apparently sound coating protecting substrate, no paint breakdown. SC3: FAIR Some substrate exposed for undetermined time due to incidence of paint breakdown - requires preparatory work and spot priming. SC4: POOR Substantial areas exposed to weathering for substantial time or never painted. Important conditions of guarantee: Cannot in any way be construed to be a joint and several guarantee. Consequential damages are excluded. Full guarantee terms apply for the first five years, and a diminishing pro-rata guarantee for the remaining years of life expectancy. If in doubt about any aspect of your specification or project please contact Resene.